Every day the sun rises and the sun sets. The sky presses down upon us as we live out life on earth. Once a year, we human people gather to remember how life got to be this way. We don’t remember this as humans. We remember as the first peoples: the animals and plants, the rivers and wind and rain, as Father Sky and Father Sun. 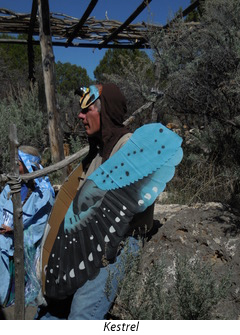 In the spring, the Grand Junction/Mesa Community (Colorado, USA) re-enacts the creation story of the Grand Mesa, whose ancient name Toombeappah Sooparter Kahan Kaib means “Sky-Mountain House.” The Grand Mesa is the largest flat top mountain in the world and rises 11,000 feet above the ocean and about 7,000 feet above the Colorado River and canyons. Weather is in constant motion above its flat top, and each winter snow piles up at least to twenty feet toward the promise of spring waters. 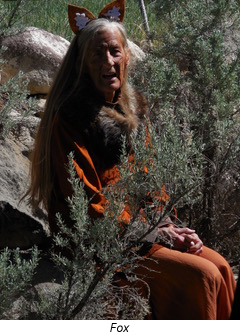 Grandfather Fire gave the sacred narrative of how Toombeappah Sooparer Kahan Kaib came into being to the Mesa Life Project group during a special audience in 2009. 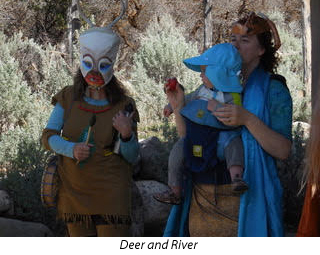 Every year human people from this community don fur and feathers, as well as garments of rain, clouds, rivers, wind, and sun, in order to transform into first peoples for the re-enactment. The story had been forgotten and the first humans no longer live here to remember it. In the old stories of the Ute (the Native American people who most recently lived here before colonizers came,) the human peoples were scattered across the land by coyote, a trickster at best. Creator had given coyote a bag of humans along with careful instructions to disperse The People (the Ute) in a particular manner. Of course, it didn’t happen quite that way. Today, the Utes have been moved from the Grand Mesa, and this mountain has been sitting here for a hundred or more years waiting to be reawakened by humans. Through the telling of this story, the majestic being Toombeappah Sooparter Kahan Kaib is honored. As with every indigenous creation story, this tale has teachings and lessons, and gives the human mind a reason to be grateful. It helps us to remember how the gods move to make room for all of life here. The bear climbs to the top of the Mesa to bring the prayers of humans to the gods. There is a promise in this story that once this place is reawakened it will again be a place for people to seek vision, wisdom and knowledge. You are welcome to come here and dance with us, to create a life on the foothills of Toombeappah Sooparter Kahan Kaib. Every day is a reenactment of the creation story. We emerge from dense unspeakable material, through the shimmering power of dreaming stuff. This is the first world, and the last. Once we abandoned ourselves for television, the box that separates the dreamer from the dreaming. It was as if we were stolen, put into a bag carried on the back of a white man who pretends to own the earth and sky. In the sack were all the people of the world. We fought until there was a hole in the bag. When we fell we were not aware of falling. We were driving to work, or to the mall. The children were in school learning subtraction with guns. We found ourselves somewhere near the diminishing point of civilization, not far from the trickster’s bag of tricks. Everything was as we imagined it. The earth and stars, every creature and leaf imagined with us. The imagining needs praise as does any living thing. We are evidence of this praise. And when we laugh, we’re indestructible. Or the inverse power of rising up. Our children put down their guns when we did to imagine with us. We imagined the shining link between the heart and the sun. We imagined tables of food for everyone. The imagination conversely illumines us, speaks with us, sings with us, drums with us, loves us.